Gutter Professionals of Greater Houston is a family owned business established in 2002. We provide top-notch customer service for all your gutter needs including the #1 gutter covers in the USA, Gutter Helmet. Our professional sales and installation services for gutters systems are offered to homeowners in greater Houston and the surrounding areas. With over 10,000 installations, you can count on us to provide quality service, reliability and dependable products installed by our factory trained technicians. We provide our customers with EXACT pricing. We don’t give you a ballpark figure on our job proposals as many other companies do. With us, what we say is what you get! Members of the BBB since 2002, we have maintained an A+ Rating without a single complaint! We are also proud to be an annual Gold Star Certificate recipient. Gutter Professionals of Greater Houston has had a lot of experience with gutters and gutter protection over the years. We have found Gutter Helmet to be a top of the line and very effective gutter protection system. If gutters are not kept clear of debris, they can become clogged and water can backup and overflow, eventually causing damage to the roof, walls, landscaping and foundation of a house. Most homeowners have better things to do than climb up and down a ladder cleaning out their gutters. With Gutter Helmet gutter covers, clogging debris can’t get into the gutter system. Gutter Professionals of Greater Houston can end your gutter cleaning days. 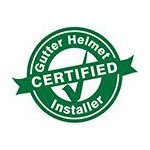 Call us at (800) 824-3772 to get a free quote on Gutter Helmet gutter covers or use our convenient online request form and we will get back to you ASAP.